This is a relatively easy walk, but good fun, and worthwhile. The secret is to use the zigzags whenever possible, and avoid the zogs. It is categorised as Difficulty 2, as there is some easy scrambling on the summit ridge, aided by fixed cables, where a short line will be useful for members of the party lacking in confidence. Follow the track to the piste area. Immediately after passing a low building on the right, take the next track (under 10 minutes from the car) leading into the forest to the left. This ascends gradually to the north, until returning to the south. At the end of the track (1547 m) a footpath ascends to the north before returning, and emerging out of the forest into pasture. This leads to a cabin, the Cabane du Bachasson, and spring (1635 m), reached some 40 minutes after leaving the car. The route now zigzags to and fro across the steep flower-strewn pasture for some 20 minutes, to a huge mushroom-shaped boulder, la Folatière (1743 m). Don't take the obvious route to the right, but take the smaller path rising to the left of the boulder, and ascend towards a large gully which splits the cliff. The route ascends the impressive gully (easier on the right to start with) for some 10 minutes, before emerging onto the summit slopes. This is ascended easily using the zigzags. There is no mistaking the summit ridge - it plummets on the eastern side by a couple of hundred metres. As usual, the views are superb, with the cliffs of Dent de Crolles and the Grand Som being particularly impressive. You need to be a little careful of fast-flying swifts and low-flying gliders, but it's a good place to spend half an hour over lunch. The way up is not recommended for descent for two reasons. Firstly, it's a little too loose to be pleasant, and secondly, there's a far nicer way down. Follow the ridge a short distance to the south, to an easy cable-assisted descent down a 10 metre chimney. From here, there are two paths apparent in the distance - the first is a scree-strewn path going off some distance beneath you, and the other is a path continuing along the crest. The latter is easier, and far more pleasant. Make for this. 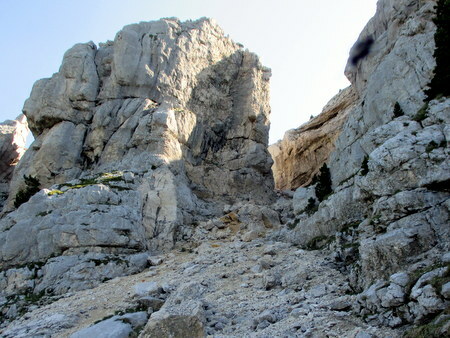 Some 20 minutes after leaving the summit, the path passes by the brèche Paul-Arnoud, a cable-assisted ascent up a chimney from the north side of the ridge. Soon after, the path starts to descend, and joins the other route. This area of pasture has a particularly fine display of martagon lily in the early summer. The path then returns north reaching the big boulder some 40 minutes after leaving the summit. You now reverse the ascent and arrive back at the car within 90 minutes of leaving the summit, after a very pleasant and very easy walk.